Think of these like a vegan version of Rolos® candies, each piece being a delicious vegan caramel enrobed in smooth, creamy chocolate to pair the two delights together perfectly. They're dairy-free, wheat-free, gluten-free, and egg-free, making them a tasty vegan treat you're going to love. Each 4.5 oz. 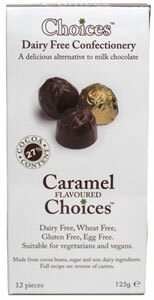 (125g) package contains 12 individually wrapped sweets. Imported from England. $7.99 per package. From Abigail of Pittsburgh , Pennsylvania on 4/11/2019 . I have tried so many dairy free chocolates and have found only a handful that were actually good, and these are one of them. I would compare them closest to Lindt lindor chocolate. It’s got a little bit of a harder shell than lindor truffles, but the cream type stuff inside is almost comparable. The chocolate is sweet without being “I feel sick” after eating 2, and it surprisingly isn’t bitter like most vegan chocolate you get. Obviously vegan chocolate will never be as creamy, melt in your mouth like actual dairy products do, but this one is definitely a must try! From Anonymous of Alexandria, Virginia on 1/7/2019 . Creamy chocolate that is hard to find vegan. But I didn't taste any caramel. From eggplant of vineland, New Jersey on 11/13/2017 . these aren’t chewy at all, like the catamel in a rolo, so t know why they’re described that way, but they are delicious! the center is more of a cream with a chocolaty slightly caramel taste. it melts in your mouth and the chocolate that enrobes it is a smooth delicious milk-style chocolate. so many vegan chocolates are euther dark or if they attempt ‘milk-style’ it’s either thin or sickeningly sweet. these are neither....they are perfect.